We all want to have attractive lush lawns. It is a sign that we take care of our lawns and we do it right. But, how can you really achieve it? The secret formula to having a green lawn is to determine what the best lawn fertilizers for your lawn are and when to apply them. Using a lawn fertilizer is a superb lawn care trick. It makes the grass color to look better. Besides, the grass needs to be protected from stress, like dry or winter month. If you use these fertilizers, diseases will stay away from your lawn, and weeds too. Buying the best fertilizer for your lawn can be a daunting task. All the numbers on these products can confuse you. And that’s where we come in. Discover what you require to purchase the best fertilizer for your lawn in this post. Green grass is healthy grass, and to maintain a healthy lawn, you should fertilize it according to its needs. Safer Brand is a famous brand in the world of grass fertilizers, they provide a wide collection of products which leads to a healthy, lush lawn. 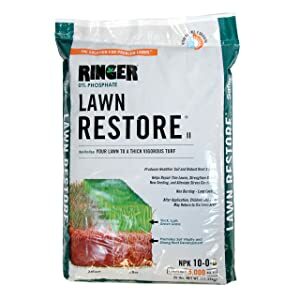 One of their famous fertilizer is the Safer Brand Ringer Lawn Restore, which is a plant-based fertilizer that doesn’t contain bio-solids or poultry litter. This organic product immediately activates and begins to work to create the right balance of required elements in the soil. And the best thing, it doesn’t produce odor and covers about 5,000 sq. ft. for faster greening of your grass. The fertilizer gives you a greener and healthier lawn in less than 5 days, making it the perfect formula for turf, facilitating healing or growth to existing grass. Natural fungi and bacteria produce some nutrients which improve the growth of lawn and help to maintain its health, this fertilizer helps in feeding these organisms. The fertilizer also helps to remove weed from the grass and leads to the development of a strong and deep root system under the soil. I know you understand that deep, strong roots play a vital role in maintaining the health of turf while shielding it from drought and diseases by offering healthy nutrients to your lawn. Safe to use around pets and kids. 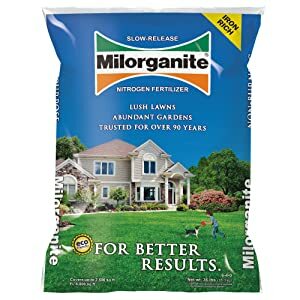 The second fertilizer in our review is the Milorganite 0636 Organic Nitrogen Fertilizer, an organic product made of heat-dried microbes that make your lawn healthy and greener for long period. This all-purpose product is safe for your pets and kids and is suitable for spring, fall, winter, and summer. It features 4% of non-staining iron which aids in deep greening your lawn. The product fulfills the EPA’s quality of standard, which is seen as the most important quality of the best fertilizers. It comes in a long-lasting 36 pounds plastic bag package. 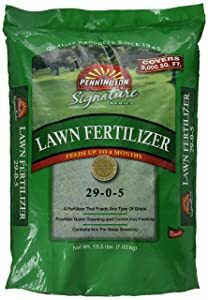 The only major concern of this fertilizer is that it’s a bit smelly when you first open the bag, but after watering your lawn, the odor will die. Due to its granules nature, it is very easy to spread it and it also functions as bugs repellent for plants and flowers. Frequent use of this fertilizer leads to greener grass for a long time. I especially love this fertilizer as it has given me a lush green garden that is attractive to the eyes. Safe for pets and kids. Provides iron for greener grass. You wish you had a lawn that you can jiggle your toes during the weekend! You can water your lawn ten times a day, but it won’t receive the types of macronutrients it can receive from Pennington Signature Series Lawn Food. All the nutrients it requires to thrive and be attractive to your eyes. When you feed your garden with this product, you will be excited to hear that your lawn will receive 2 kinds of personality: quick greening as well as controlled release. This means that you will experience instant results and long-term success. The fertilizer features granules that break down slowly to offer your soil the much-needed elements to continue supporting your lawn for up to 4 months. This grass food is full of critical iron, potassium, and nitrogen that all plants require to grow healthy. However, it doesn’t contain phosphate. The nitrogen grows the grass and deepens its color, the potassium assists the nitrogen, and the iron makes your lawn even greener. Make this product your number one fertilizer and your neighbors will envy your lawn. Feeds your lawn for 4 months. Contain iron for deep greening. 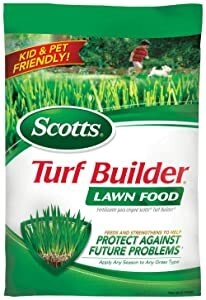 Scotts Turf Lawn Food enables you to unlock your best lawn season. When you feed your lawn with this product, you are establishing strong roots that can deal with stresses caused by dry weather or any other activity. The product helps your grass to absorb nutrients and water in the soil with ease. In fact, your lawn will absorb nutrients and water better than other lawns. It will become more efficient in using these materials. Applying this fertilizer is very simple; you only need to feed it to the grass regularly, water the grass, and your lawn will look lush green within days. The product helps to create a thick, green garden. It is formulated with patented All-In-One Particles to offer an even greener lawn. It also thickens the grass to prevent weed development and strengthens it to protect it from any future problem. Can be applied any time of the season. Helps the grass to absorb water and nutrients. Not recommended for dormant grass. Takes a while to see the results. 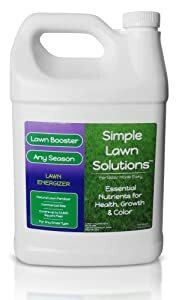 Brought to the shelves due to thousands of customers request, Commercial Grade Lawn Energizer comes in a refill quart size bottles which can be used with a pump to spray your lawn. It covers about 12,000 sq. ft. and is a high-quality grass booster enhanced with nitrogen to make it perfect for fall. This booster is uniquely made to energize the soil and your turf to it optimum nutrients level for maximum color, growth, and health. This simple product is made of 100 percent natural organic elements with added essential nutrients and vitamins. The fertilizer covers all the needs of your grass for healthier growth and it is perfect for all type of grass – this is because it is natural, non-toxic, and contains vitamins and minerals. The best thing, it is safe to use even if you have kids and bets. Made in the United States, the fertilizer offers you lawn with the vital nutrients it requires over a long period of time. With that said, the manufacturer recommends you use this fertilizer in conjunction with Green Booster and Lawn Food for the best results. Can be used any time of the year. Suitable for all type of grass. Safe for use even if you have pets and kids. Comes in a bottle that requires a pump. Needs to be used with other products. Our pick of the best lawn fertilizer is the Safer Brand Ringer Law Restore Fertilizer. This is a slow release natural fertilizer that offers nutrients that provide thick, green grass and deep, active root system. It contains high-quality, all-natural ingredients such as soybean meal, feather meal, and nitrate of soda meal (no synthetic or manures added). It is very easy to apply these pellets, it doesn’t burn your lawn, and covers 5,000 sq. ft. 5,000 sq. ft. is a big area to spread the fertilizer using your hand, isn’t it? Therefore, you might require an accessory to help you and which one is better than the Scotts Wizz Hand-Held Spreader? This is a spreader that doesn’t require you to break the bank to get it. It offers you the convenience you require when spreading your fertilizer and its single fill can cover 2,500 sq. ft. This is a protein apparent in all plants, so it goes without saying that supplementing it would spur grass growth. That’s not all because it helps your lawn to fight off harmful pests. It is one of the nutrients that promote the lavish green color in your lawn. This is an ingredient that provides your grass its ability to turn nutrients into growth-material. Fertilizers contain nutrients, but phosphorus allows these nutrients to provide a robust root. For instance, if you have a new lawn and wants to enhance its growth, applying a fertilizer with phosphorus can help you achieve that. On the other hand, if your lawn has been around for decades, you should avoid fertilizers with phosphorus. Just like nitrogen, potassium is meant to spur the growth of your grass. It is called the “quality nutrient” because it affects your grass shape, color, and size. If you come across a healthy looking lawn, chances are it’s because of potassium. Additionally, potassium helps your grass to develop resistance to drought and cold. If your lawn is new, you will probably want to invest in an N-P-K fertilizer. The proportions of these nutrients are shown on the bottle or bag. The bag might show something like “10-6-4” (10 parts N, 6 parts P, and 4 parts K). 5-pound of nitrogen or 10 percent. 3-pound of phosphorus or 6 percent. 2-pound of potassium or 4 percent. Clay or sand will make up the rest of the weight. This helps you to spread out the fertilizer easily. Too little or too much acid in the soil is harmful to your lawn. When you test the pH, you will see if it is in the recommended range of 6.5-7.5. If it is below 6.5 (acidic), you should add lime, if it is above 7.5 (alkaline), you should add an acidic fertilizer such as sulfur, ammonium sulfate, or ammonium nitrate. Generally, when you hit the market, you will come across 3 different kinds of lawn fertilizer: water-soluble, granular, and organic. Organic type is all-natural and you can easily make it at your home. This is what is commonly known as compost manure. Organic fertilizer breaks down slowly releasing nutrient back into the soil. The soil then feeds your lawn. Granular type of fertilizer comes in time-release formulas and enables you to control when your lawn will be fed. Water-soluble type is an instant-release fertilizer, so the results will be instant (about 5 days). This type of fertilizer uses ammonium-based products to help your grass absorb the solution easily. and how available you are to take care of your lawn. Considering these four things can help you make an informed decision for your lawn’s specific needs. For instance, if you are around throughout the summer/spring to watch your lawn, the water-soluble type might be the best. On the contrary, if you can’t get time and you won’t be around, the granular type might be the one for your grass. Also, ensure that you note any other issue that your lawn might be having. Lawn fertilizer can include ingredients that ward off pests or bugs and removes weeds like black clover, crabgrass, and chickweed. You can also get fertilizers with extra ingredients that enhance fast-growth. Knowing the type of grass in your yard can be a critical step in figuring out what types of fertilizer to buy. As a rule of thumb: if you dwell in an area with a hot climate, this area will have warm season grass. These types of grass need between 3-4 pounds of lawn fertilizer for every 1,000 sq. ft. annually. On the flip-side, colder regionals have what is called cool season grass. This grass requires about 1-2 pounds of fertilizer for every 1,000 sq. ft. annually. It is a sturdier grass that can withstand more, so it requires less lawn fertilizer-care. The simplest way to estimate the amount of fertilizer required by your grass is to measure your lawn’s surface area. Take a measurement of length and width to compute square footage. Alternatively, you can do a strategic guess, which will be almost as accurate as measuring. In general, every 8 steps are roughly 10 feet of space. Walk from different sides of your lawn as you take the width and length. You will get an idea of how much area you need to cover. As a visual guide, consider a standard tennis court which measures 36 feet by 78 feet. Determine the width and length of the triangle. Multiply the width by the length and then divide by 2. This answer will be your lawn’s surface area. Find the center of your lawn and walk out toward the edge. Multiply 3.14 by this number to get the surface area. The rule of the thumb is to fertilize your lawn as early as possible. You should get the right nutrients to your lawn when it is growing and when it primarily needs them. One trick you can follow is to check the weather forecast in order to fertilize your grass one day before the rain begins. This is the best way to put down your fertilizer and let the Mother Nature do the rest (the hard work). If your lawn is grown, fall is the perfect time to fertilize it. The idea behind this timing is to ensure that your fertilization coincides with the cooler temperature and during the wet time of the year – the perfect condition for your grass to absorb the nutrients easily. The second best season of fertilizing is spring. This is when your lawn is coming back to life and wants food. Applying a quick-release weeding fertilizer can be a good idea since it will starve pests and weeds. It also helps your lawn to develop strong roots – ideal for withstanding harsh weather during the dry season. Some lawn owners just spread these fertilizers like chicken feed. This is wrong since you will most likely get irregularities in the color of your lawn as the fertilizer starts to work its magic. You should get a fertilizer spreader, which will make the task easier. However, these tools can make your work even harder if they don’t function easily, you don’t know how they work, or if they aren’t effective. They used to work quite well. Sadly, some manufacturers have changed these products, and what used to be a simple, useful tool is now the number one source of frustration. With that said, there are still great applicators out there. These types can be a broadcast-style or drop-style wheel spreaders. Each has its lawn depending on the shape and size of the surface you want to apply your fertilizer. The neighboring area might also affect your choice. A broadcast spreader spreads the fertilizer in a bigger area, and the distance it spreads is influenced by how slow or fast you push it. A drop spreader simply drops the fertilizer to the ground. The only concern with this style is to avoid overlap as you move back and forth, and always close the hopper when you rest. Whichever brand and model you decide to buy, make sure that the manual is easy to follow and offers all the setting. These machines are calibrated with various size openings, but with no guide, you will be using the machine blindly. Which ever way you spread your fertilizer, be aware that these fertilizers might stain your brick and concrete, especially if they have iron. Sweep it thoroughly before you water. 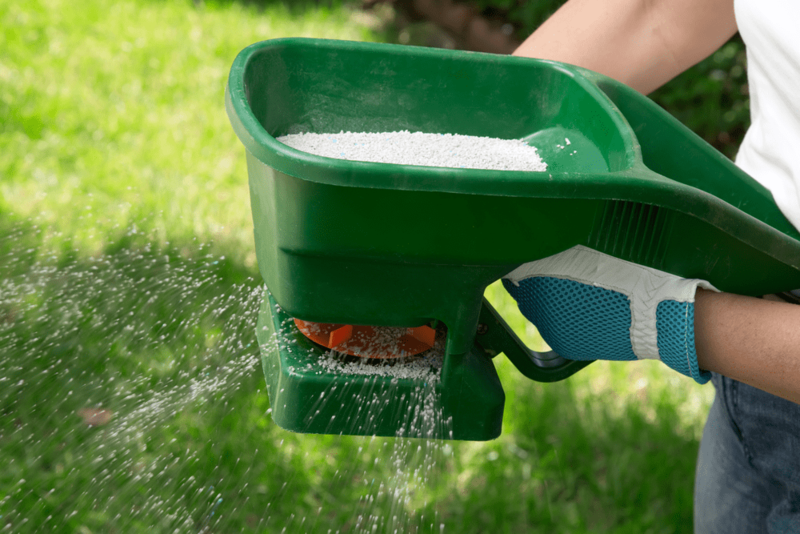 Q: Can I store unused lawn fertilizer for use next season? A: Yes. You can easily store and reuse unused fertilizer as long as it bag is tightly closed and kept in a dry place. If water finds its way into the bag, you will have lumping of the fertilizer, break up these clumps before you place it in your spreader. Q: How many lawn fertilizer applications should I do during the year? A: We would recommend you to apply these fertilizers at least two times a year for cool season grasses, one in fall and one in spring. If you decide to do just once per year, do it during fall. For warm season grasses, we would recommend you to do it regularly – during the hot months. Q: I want to de-thatch my lawn. Is it okay to apply the fertilizer before I dethatch or should I apply it after de-thatching? A: You should always apply your fertilizer after de-thatching. Q: What are the 3 numbers on lawn fertilizer bags? What do they mean? A: These numbers represent the percentage or concentration of 3 nutrients that are required by your grass. For instance, 10-10-10 is read as 10% Nitrogen, 10% Phosphorus, and 10% potassium. With that comprehensive review and guide, we hope you can easily find out what the best lawn fertilizers are on the market today. We hope you have found everything you wanted and you will make a more informed decision when you hit the market.